Vaseline is undoubtedly one of the most popular lip care brands around today and is likely to remain as such for years to come. I have dabbled in various forms of Vaseline in the past and though I love the price, formula and the multi purpose aspect of the product, being more of a stick girl I just don’t get along with the tin packaging. I’ve tried various lip balm pots in my time, from Vaseline to Body Shop lip butters and Carmex and I have to say I still much prefer things in stick format. They are generally cleaner, smaller, more hygienic, I don’t use too much and I don’t get my hands covered in excess product. I realise Vaseline have been doing stick balms for quite some time now but it was only recently I stumbled across the Rosy Lips Lip Therapy Stick. This is basically the stick version of their tinted rose Vaseline which was first released in a tin only format. I really like the idea of tinted lip balms but have found it difficult to find one which is perfect for giving a very subtle matte colour which doesn’t collect in the lip creases after prolonged wear, and which leaves the lips looking slightly fuller. Rosy lips in the stick format is far more matte than the tin formula so it really does just look like your lips are having a really good day. It looks completely natural and very subtle, giving you a just bitten colour and an ever so slightly plumped effect whilst keeping your lips soft all day long. 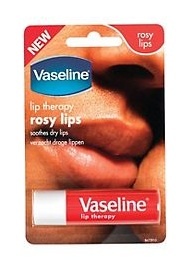 Pick up a Vaseline Rosy Lips Lip Therapy Stick is priced at £2.03 and is available from Boots.